In the first 10 years after the California Gold rush began, some $600 million in gold was discovered in California as its population exploded from a minuscule 25,000 to more than half a million. The great rush wrought an overnight transformation in the future Golden State. Indeed, it was responsible for making California the nation’s 31st state: The flood of Forty-Niners that descended on the region in 1849 opened the door to statehood the very next year. While much of America teetered on the brink of civil war, Californians were preoccupied with finding their personal fortune and staking a permanent claim to it. The gold rush changed the face of U.S. coinage, as well. 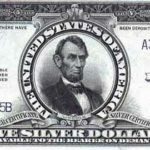 The massive amounts of gold emerging from California prompted Congress to authorize three new denominations—a gold dollar, a $3 gold piece and a double eagle, or $20 gold piece—between 1849 and 1854. In large part, these were intended to help convert the mountain of metal into a form more usable by the public. 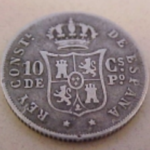 Double eagles, of course, accounted for the bulk of the coins made. Between 1850 and 1854, over eight million were struck. The gold dollar and double eagle—the smallest and largest regular-issue gold coins in U.S. history—both had their genesis in the coinage act of March 3, 1849. And both were designed by James Barton Longacre, the U.S. Mint’s chief sculptor-engraver. Objections arose almost at once to the dollar’s tiny size: At 13 millimeters in diameter, it was more than one-fourth smaller than today’s Roosevelt dime, and critics complained that this made it easy to lose. Mint officials took these protests seriously, and over the next few years test strikes were made of a number of possible substitutes that were larger in diameter but compensated for this with center holes. 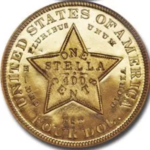 Initially, the gold dollar had a head of Liberty much like the one on the double eagle. By 1854, when Snowden ordered the changes, Longacre had a new model available: He had just designed the $3 gold piece, and he patterned the new gold dollar after that. Its obverse features a left-facing portrait of a female figure wearing a fancy headdress. The female figure is frequently described as being an “Indian princess,” and the coin is commonly known as the”Indian Head” type. His reverse design shows the date and denomination within a wreath of corn, cotton, wheat and tobacco. Renowned numismatic scholar Walter Breen argued persuasively, that the head Longacre used wasn’t that of an Indian at all, but rather a copy of Venus Accroupie, or “Crouching Venus,” a Roman marble figure then on display in a Philadelphia museum. Longacre had used this same head on the gold dollar and twenty of 1849; he would use it again on the Indian Head cent and the three-nickel, each time with a different headdress. Being 15% larger in diameter, this Type 2 gold dollar was easier to keep track of—and less likely to get lost—than its predecessor had been. Unfortunately, however, it had a major shortcoming of its own: Longacre had made the relief on the obverse too high, and the overwhelming majority of the coins were less than fully struck as a result. 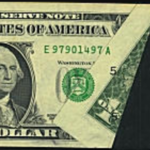 Very few examples exhibit sharp details in the hair, the word DOLLAR and the date—and even the designer’s initial L, located on the truncation of the bust, is often barely visible. Branch-mint issues are particularly weak. Key points to check for signs of wear include the hair over the eye and the bow knot at the base of the wreath. Breen estimates that less than 1% of the Type 2 dollar mintage still exists—in all grades. 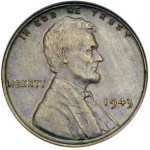 The coins wore down so quickly when exposed to circulation that within a few years, much of the total output had been rendered almost illegible. By then, gold dollars—like much of the nation’s coinage—had all but stopped circulating anyway because of widespread hoarding during the Civil War.